There’s been a ton of snow in Maryland just this week, which has me thinking about the weather. When writing fiction, the writer controls every aspect of the world they’re creating. We imagine characters, how they look and act, and what they wear. We create settings on present-day earth, future and past versions of our world, fantasy lands, storybook villages, spaceships, far-off galaxies, etc. We control nature, natural disasters, and the weather. The weather can be a poignant layer of the setting and it really adds an extra dimension to a story. Unless it’s set in constantly sunny LA or forever-blizzard area like Antartica, the weather could take on a variety of iterations just in a single book. I’ve noticed authors use the elements to add to their stories, so I wanted to highlight ways weather can really enrich your writing. I see this type the most—a character's mood and feelings dictate the weather outside. When a character is sad it starts raining outside, and a beautiful sunny day reflects happy characters. Similarly, a peaceful, joyous moment of someone connecting with loved ones may be set amidst a gentle snowfall. A character’s emotions almost seem to influence nature. Although this is a great literary device, it can be overused. Too much weather/mood matching is not very believable, and it will make you lose credibility in the eyes of the reader. This is one of my favorite uses of atmospheric conditions. Specifically, a happy or excited character must be incredibly enthusiastic if their mood persists despite a storm raging around them. Or when a character is really down or sad but the sunshine and clear skies remind them that life goes on regardless, making them feel even more isolated in their despair. Although the contrast of mood and weather is fairly common, it doesn’t feel as cliche as having the mood and weather always match. Any outdoor setting is going to have a climate. Even mythical worlds should have weather conditions which reinforce the type of vegetation and impact the culture. It also adds verisimilitude to a setting pulled from the real world. A story set in Seattle should include lots of rain, while another tale set in the desert should not. A brooding storm can act as foreshadowing of bad things to come, while rain can symbolize purification. When someone has been trapped and finally emerges outside for the first time, they’re always greeted with abundant sunlight—a symbol of their bright future and the beauty of nature. Literature uses weather as a symbol a whole lot, but it can be missed if you’re not looking for it. There are entire stories which revolve around a particular meteorological event. A notably bad storm can be the climax of a story. Perhaps the characters know a downpour is coming, and they have to quickly pile sandbags up to prevent their town from flooding. Or, the unrelenting sun in a dry spell threatens to kill all the crops and leaves no water for people to drink. And, of course, there are the extreme examples of the elements driving the plot like Sharknado and 2012. 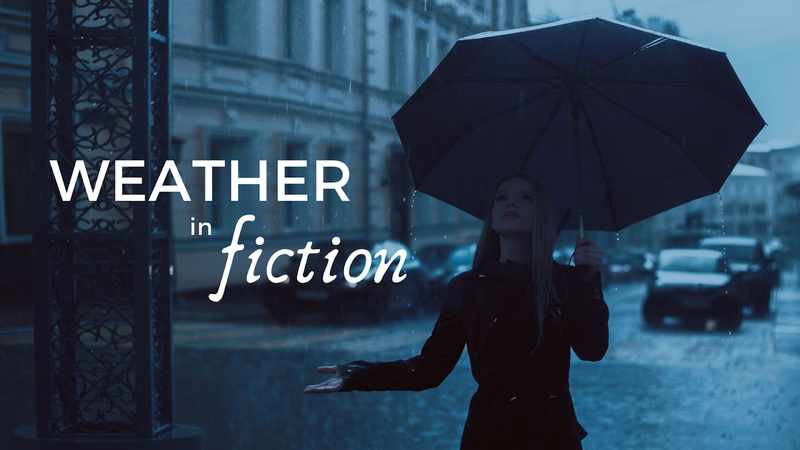 For the next fiction story you read, I challenge you to notice the weather and think about how it adds (or doesn’t) to the story. And before I go to the store to stock up on milk and toilet paper, I thought I’d end this post with an excerpt from Quality DNA where the weather really adds to the scene. Jamie walked around the gallery space, getting an idea of how many pieces she’d need for her upcoming show, and where she’d put them. The gallery was currently closed between showings. No one was booked for the next few weeks, and soon it would be her turn to show off her work. There was a sharp knocking at the door. She turned to find the source of the sound and saw Aiden standing there. “I don’t think I should,” he said. She realized he didn’t have his normal genial smile on his face. Instead, he wore a serious expression. “Nonsense, I insist,” she said. He finally stepped in, a puddle forming around him on the marble floor. He looked at her, his eyes pleading. “I can’t do it,” he reiterated.